Meeting the PM of Bhutan & Getting Stranded in the Gobi Desert with Cory. To kick off our Explorer Series, we’re sharing with you the tale of a serious adventurer who left on a two month bike ride from Chile to Peru when he was 23 and hasn’t slowed down since. From being followed by Sumatra’s monkeys, to hanging out with the Prime Minister of Bhutan in his palace, this professional mountain bike racer’s wheels have taken him where few others have been before. So without further ado, meet Cory Wallace. Cory has spent the past years of his life participating in (and although he’s too humble to bring it up himself, winning) some of the most extreme bike races around the world. There’s been a lot of mud, a lot of sweat, a lot of unreal adventures. So what compels someone to push their exploration so far off the beaten path? At the age of 23 he decided he wanted to get back into bike racing. So he did what only a real adventurer would, and flew down to the tip of Chile with a bike, a BOB trailer, and all of his camping gear, to spend two months cycling through Chile up to Peru. In spite of the initial shock and a significant amount of headwind and heat on his ride up to Peru, this adventure was the catalyst to kickstart his passion for global adventuring on his bike. The following year he flew down to Costa Rica for the cross-country race La Ruta de los Conquistadores and carried on to cycle Panama for a month afterwards. He was set to head home for Christmas when United Airlines had a baggage embargo and wouldn’t take his bike on the flight. Not wanting to leave his number one travel companion behind, Cory biked north into Mexico. These initial trips down to South and Central America set the stage for Cory’s continued races and adventures around the globe. Maybe one of the most incredible ones was his time in Bhutan for the Tour of the Dragon. This race goes across the country on its highway network from east to west. They were working to widen the road at the time so it was a giant construction zone. Not to mention it was rainy season. It was one of the toughest races I’ve done. When I finally got close to the capital city, Thimphu, I was going into town but I had no idea where I was going. So 4 cop cars surrounded me and they led me through the crowds into town and we finished in the town square. I got off my bike and the Prime Minister was there and as he was putting a prayer flag on me, and giving me this butter lamp, he was like, “do you want to have a meeting and talk about biking?”. So he invited me to his palace 2 days later. We just bullshitted about biking. The Prime Minister’s a biker himself and he was getting a kick out of it because he raced the same race two years before and the conditions were good. His time was a bit faster than mine so he kept bugging me about that. It was totally cool. He’s the most down to earth political figure I’ve ever met. He’s just a normal person who wants to make people happy, you know? You go to Bhutan and they really just look after the basics. They look after the environment, they look after happiness, there’s not a huge push on just expanding and growing their economy. They want to make it a pristine country where everyone wants to go. The mountains are still covered in trees. It’s really an oasis amongst the chaos. How does Cory Stay Healthy while travelling? 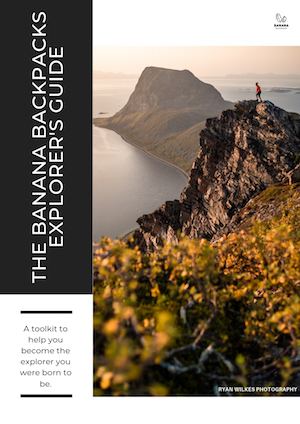 Download the Explorer’s Guide to get Cory’s tips for staying healthy on the road + incredible travel tips from all of the Banana Backpacks Explorers. Cory’s wilder cycling adventures continued in nearby Mongolia where he raced 120 km a day across the Gobi Desert. An amazing experience in a largely deserted area – until a flood had them stranded. “One day it started raining and just before the finish line there was a big river we had to get across. The first few of us got across the river and it was waist deep, which was manageable but not super safe. By the time the last people came, the river was raging. So they had to hop in jeeps and jeep them across the river. The next stage of the race we were supposed to go across this other river and down it, with about 25 river crossings. But when they went to scout it out they lost one of their jeeps because the river was so high. It was just too dangerous to race. We were stuck on this island between these two big rivers, so we camped there for 2 days, and they were on the edge of calling helicopters to rescue us. And then some locals came and told us about this way out 15 km upstream. The next day we all packed up and drove up there. Even for that river crossing they had to tie the jeeps to these big 5 tonne monster trucks. Then they would tow the jeeps into the river. They’d get swept downstream and the monster trucks would just keep going to pull it out. They had to do it 12 times for every single jeep of the 12 jeeps. Besides extreme encounters with the elements, there have been a time or two of even more white-knuckling experiences along Cory’s travels. Visiting the island of Sumatra in Indonesia brought one of these. “I was biking north and the cops stopped me and asked where I was going. I told them “Lake Toba”, and they were like “no you’re not, you’re headed towards where all the drug lords are, through this corn field. There’s no place to stay there at night and you’re likely to get robbed.” So at that point I was pretty nervous. I don’t know where I am, I have no real history of this country. I didn’t know what to do so I went back to town and hopped on a bus going to [the city of] Medan. And the bus driver was so kamikaze, passing on blind corners and I’m surprised we didn’t die. It was a ten or twelve hour bus ride and we got to Medan. From Medan I started up towards a little tourist town on my bike. And then there were a bunch of monkeys on the highway that started following me – a whole pack of monkeys following me – and at that point I was like this is silly, one thing after another. With these difficult and amazing experiences on the road always come changed perspectives. For Cory, the place that has had the biggest impact on him in this way has been Nepal. “The bike mechanics there that work at good bike shops make about 3 dollars a day. Seeing how poor they are and how they go about their daily lives, it’s really just about getting rice on the table. But at the same time they have such a focus on religion, on family and looking after each other and they’re so happy too. It taught me that it’s not what you have, or how much money you have, it’s about having good family around and making the best of your situation. The Nepali cyclists have always inspired me to be a happy person. They’re on these beaten up bikes, and always have mechanicals and flat tires during races, but they never complain. They just laugh about it and get on with it. The first few times I was in and out in 2 weeks but living there for 5 months and biking the countryside you get to really feel the country. It changed my perspective”. This fall has races in Norway and Scotland in store for Cory before he’s off to Nepal again. He’ll be racing the Yak Attack in November and staying after the race to help out with a fundraiser to support the running of a cycling centre in Kathmandu. This Explorer is inspiring us to get out of our comfort zones, whether on or off the bike, and make a difference. You can follow along with Cory’s adventures and global races on his Instagram or blog. Download Cory's Tips for Staying Healthy on the Road. Our pleasure! Glad you enjoyed the read!